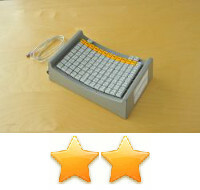 We have provided here a description of common conditions and disabilities in alphabetical order that typically give rise to difficulty using a computer keyboard. 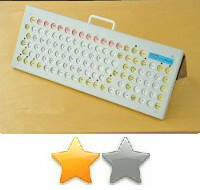 Against each entry we have listed one or more of our keyboards that may be appropriate for that condition. The information below is intended to help align keyboards with conditions or disabilities. 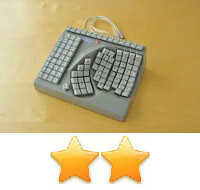 Two stars­ show the most suitable keyboard. 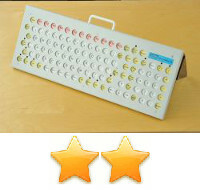 One star shows that the keyboard may be suitable in certain cases. A note about Repetitive Strain Injury (RSI) and Work Related Upper Limb Disorders (WRULDS). These are broad terms covering a range of conditions, the most common of which are included below. If you suffer with RSI or WRULDS, it is likely that it will be caused by one of these. However, if in any doubt, please seek professional medical advice. 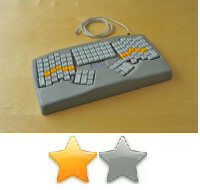 Please also note: The guide is not definitive, and shows only potentially suitable keyboards for any given circumstance. If in any doubt, please contact us and we will be happy to help! Any medicines and treatments described here are examples only. You should always consult a healthcare professional before taking any medicines or embarking on a course of treatment. 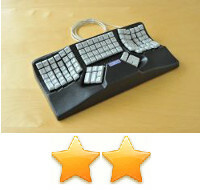 Where use of one or both hands is lost due to amputation, leading to an inability to use a conventional computer keyboard. Bursae are fluid-filled cavities near joints where tendons or muscles pass over bony projections. They assist movement and reduce friction between moving parts. Bursitis is inflammation of the fluid-filled sac (bursae) that lies between a tendon and skin, or between a tendon and bone. The condition may be acute or chronic. Bursitis can be caused by chronic overuse, trauma, rheumatoid arthritis, gout, or infection. Sometimes the cause cannot be determined. Bursitis commonly occurs in the shoulder, knee, elbow, and hip. Other areas that may be affected include the Achilles tendon and the foot. Chronic inflammation can occur with repeated injuries or attacks of bursitis. Your health care provider may recommend temporary rest or immobilization of the affected joint. Nonsteroidal anti-inflammatory drugs (NSAIDs) such as ibuprofen may relieve pain and inflammation. Formal physical therapy may be helpful as well. If the inflammation does not respond to the initial treatment, it may be necessary to draw out fluid from the bursa and inject corticosteroids. Surgery is rarely required. Exercises for the affected area should be started as the pain goes away. If muscle atrophy (weakness or decrease in size) has occurred, your health care provider may suggest exercises to build strength and increase mobility. Bursitis caused by infection is treated with antibiotics. Sometimes the infected bursa must be drained surgically. The condition may respond well to treatment, or it may develop into a chronic condition if the underlying cause cannot be corrected. Avoid or minimise activities that include repetitive movements of any body parts whenever possible. Carpal tunnel syndrome occurs when the median nerve, which runs from the forearm to the hand, becomes pressed or squeezed at the wrist. The median nerve controls sensations to the palm side of the thumb and fingers (although not the small finger), as well as impulses to some little muscles in the hand that facilitate finger and thumb movement. The carpal tunnel - a narrow, rigid passageway of ligament and bones at the base of the hand - houses the median nerve and tendons. Sometimes, thickening from irritated tendons or other swelling narrows the tunnel and causes the median nerve to be compressed. The result may be pain, weakness, or numbness in the hand and wrist, radiating up the arm. Although painful sensations may indicate other conditions, carpal tunnel syndrome is the most common and widely known of the entrapment neuropathies in which the body's peripheral nerves are compressed or traumatized. Symptoms usually start gradually, with frequent burning, tingling, or itching numbness in the palm of the hand and the fingers, especially the thumb, the index and middle fingers. Some carpal tunnel sufferers say their fingers feel useless and swollen, although hardly any swelling is obvious. The signs often first appear in one or both hands at night, since a lot of of people sleep with flexed wrists. A person with carpal tunnel syndrome may wake up feeling the necessity to "shake out" the hand or wrist. As signs worsen, people might feel a tingling sensation. Decreased grip strength may make it difficult to form a fist, grasp tiny objects, or perform other manual tasks. In chronic and/or untreated cases, the muscles at the base of the thumb may waste away. Additionally, some people are unable to differentiate between hot and cold by touch. Carpal tunnel syndrome is more often the result of a combination of factors that increase pressure on the median nerve & tendons in the carpal tunnel, rather than an issue with the nerve itself. Most likely the disorder is due to a congenital predisposition - the carpal tunnel is basically smaller in some people than in others. Other contributing factors include trauma or injury to the wrist that cause swelling, such as sprain or fracture; overactivity of the pituitary gland; hypothyroidism; rheumatoid arthritis; mechanical issues in the wrist joint; work stress; repeated use of vibrating hand tools; liquid retention in the course of pregnancy or menopause; or the development of a cyst or tumor in the canal. In some cases no cause can be identified. There isn't much clinical information to show whether repetitive & forceful movements of the hand & wrist in the coursework of work or leisure activities may cause carpal tunnel syndrome. Repetative motions performed in the course of normal work or other every day activities can lead to disorders such as bursitis & tendonitis. Writer's cramp - a condition in which a lack of fine motor skill coordination plus aching & pressure in the fingers, wrist, or forearm brought on by repetitive activity - is not a symptom of carpal tunnel syndrome. Females are 3 times more likely than males to develop carpal tunnel syndrome, perhaps because the carpal tunnel itself may be smaller in women than in men. The dominant hand is usually affected first, producing the most extreme pain. People with diabetes or other metabolic disorders that directly affect the body's nerves, making them more susceptible to compression are also at high risk. Carpal tunnel syndrome usually occurs only in adults. In 1998, an estimated two of every 10,000 workers lost time from work because of carpal tunnel syndrome. Half of these workers missed over 10 days of work. The average lifetime cost of carpal tunnel syndrome, including medical bills plus lost time from work, is estimated to be about £19,000 for each sufferer. In the workplace, workers can do on-the-job conditioning, perform stretching exercises, take frequent rest breaks, wear splints to keep wrists straight, and use correct posture and wrist position. Wearing fingerless gloves can help keep hands warm and flexible. Workstation equipment can be replaced with ergonomic equivalents to enable the worker's wrist to maintain a natural position in the course of work. Jobs can be rotated among workers, and employers can run workstation assessments to identify problem areas. The term cerebral palsy refers to any one of a considerable number of neurological disorders that appear in infancy or early childhood, permanently affecting body movement and muscle coordination but not worsening over time. Although cerebral palsy affects muscle movement, it isn’t caused by issues in the muscles or nerves. It is caused by abnormalities in parts of the brain that control muscle movements. Most babies with cerebral palsy are born with it, although it may not be detected until months or years later. The early signs of cerebral palsy usually appear before a infant reaches 3 years of age. The most common signs are a lack of muscle coordination when performing voluntary movements (ataxia); stiff or tight muscles and exaggerated reflexes (spasticity); walking with one foot or leg dragging; walking on the toes, a crouched gait, or a “scissored” gait; and muscle tone that's either too stiff or too soft. A small number of babies have cerebral palsy as the result of brain damage in the first few months or years of life. It can also be caused by brain infections such as bacterial meningitis or viral encephalitis, or head injury. Cerebral palsy can’t be cured, but treatment will often improve a child's capabilities. Lots of children go on to enjoy near-normal adult lives if their disabilities are properly managed. In general, the earlier treatment begins the better chance children have of overcoming developmental disabilities or learning new ways to overcome challenging tasks. Treatment may include physical and occupational therapy, speech therapy, drugs to control seizures, relax muscle spasms, and alleviate pain; surgical procedure to correct anatomical abnormalities or release tight muscles; braces and other orthopædic devices; wheelchairs and rolling walkers; and communication aids such as computers with attached voice synthesizers. Cerebral palsy doesn’t always cause profound disabilities. While one child with extreme cerebral palsy might be unable to walk and require extensive, lifelong care, another with mild cerebral palsy might be only slightly awkward and require no special assistance. Supportive treatments, medications, and surgical procedure can help lots of individuals improve their motor skills and ability to communicate with the world. Epicondylitis or Tennis Elbow is inflammation, soreness or pain on the outside (lateral) side of the upper arm near the elbow. The part of the muscle that attaches to a bone is called a tendon. There could be a partial tear of the tendon where it attaches to the bone on the outside of the elbow. When you use these muscles over & over again, little tears create in the tendon. Over time, this leads to irritation & pain where the tendon is attached to the bone. This injury is common in individuals who play lots of tennis or other racquet sports, hence the name "tennis elbow." Backhand is the most common stroke to cause signs. This condition may even be due to constant computer keyboard & mouse use. If your signs are related to working on the comptuer, investigate the possibility of making ergonomic changes. However, any activity that involves repetitive twisting of the wrist (like using a screwdriver) can lead to this condition. Therefore, painters, plumbers, construction workers, cooks, & butchers are all likely to develop tennis elbow. There is also pain near the elbow when the wrist is extended (bent backwards, like revving a motorbike engine) against resistance, and pain or tenderness when the tendon is gently pressed near where it attaches to the upper arm bone, over the outside of the elbow. Vibration white finger (now known as hand-arm vibration syndrome and dead finger) is a secondary form of Raynaud's syndrome, an industrial injury triggered by continuous use of vibrating hand-held machinery, often over a number of years. Excessive exposure to hand / arm vibrations can cause various patterns of diseases known as HAVS or VWF. This can affect nerves, joints, muscles, blood vessels or connective tissues of the hand & forearm. Tingling 'whiteness' or numbness in the fingers (blood vessels & nerves affected): This may not be noticeable immediately after a working day. In mild cases only the tips of the fingers are affected. As the condition becomes more extreme, the whole finger down to the knuckles may become white. Feeling may even be lost. Where blood vessels are affected, the fingers can change to a pale colour. With continued exposure the person may suffer periodic attacks in which the fingers change colour when exposed to cold. Initially the fingers quickly become pale & feeling is lost. This phase is followed by an intense red flush (sometimes preceded by a dusky bluish phase) signalling the return of blood circulation to the fingers & is usually accompanied by uncomfortable throbbing. There may be loss of manual dexterity where nerves & muscles are affected. In more extreme forms, attacks may occur often in cold weather, not only at work, but during leisure activities, such as gardening, washing the car, or even watching outdoor sports. Symptoms may last up to an hour causing considerable pain, loss of manual dexterity and reduced grip strength. Paralysis is the loss of muscle function in part of your body. It happens when something goes wrong with the way messages pass between your brain and muscles. Paralysis can be complete or partial and it can occur on one or both sides of your body. It can also occur in one area, or it can be widespread. Paralysis of the lower half of your body, including both legs, is called paraplegia, while paralysis of the legs and arms is known as quadriplegia. Parkinson's Disease (PD) belongs to a group of conditions called motor technique disorders, which are the result of the loss of dopamine-producing brain cells. The two primary signs of PD are tremor, or trembling in hands, arms, legs, jaw, and face; rigidity, or stiffness of the limbs and trunk; slowness of movement and postural instability, or weakened balance and coordination. As these signs become more pronounced, patients may have difficulty with movement, speaking, or other elementary tasks. PD usually affects people over the age of 50. Early signs of PD are subtle and occur gradually. In some people the condition progresses more quickly than in others and as it progresses, the shaking, or tremor, which affects the majority of PD patients may begin to interfere with every day activities. Other signs may include depression and other emotional changes; difficulty in swallowing, chewing, and speaking; urinary problems or constipation; skin problems; and sleep disruptions. there's currently no blood or laboratory tests that have been proven to help in diagnosing sporadic PD. Therefore the diagnosis is based on medical history and a neurological examination. The condition can be difficult to diagnose accurately. Doctors may request brain scans or laboratory tests in order to rule out other diseases. There is currently no cure for PD, but some medications may provide relief from the symptoms. PD is both chronic, meaning it persists over a long period of time, and progressive, meaning its signs grow worse over time. Although some people become severely disabled, others experience only minor motor disruptions. Tremor is the major symptom for some patients, while for others tremor is only a minor complaint and other signs are more troublesome. No one can predict which symptoms will affect an individual patient, and the intensity also varies between individuals. To function properly, your brain needs a constant supply of blood which provides vital nutrients and oxygen to the brain cells. A stroke occurs when the blood supply to part of the brain is stopped and brain cells are damaged or die. An affected person may become numb, paralysed or weak on one side of the body. Their speech may be slurred and they may find it difficult to understand speech. Some people lose their sight or have blurred vision, and others become confused or unsteady. A clot may form in an artery that is already very narrow. This is called a thrombus. If it blocks the artery, it is called a thrombotic stroke. A clot may break off from another place in the blood vessels of the brain, or some other part of the body, and travel up to the brain to block a smaller artery. This is called an embolism. It causes an embolic stroke. Haemorrhagic stroke occurs when a blood vessel in part of the brain becomes weak and bursts open, causing blood to leak in to the brain. Some people have defects in the blood vessels of the brain that make this more likely. The flow of blood that occurs after the blood vessel ruptures damages brain cells. Hypertension (high blood pressure) is a major cause of strokes. Symptoms usually occur suddenly and without warning, or they may occur on and off for the first day or two. They are usually most severe when the stroke first happens, but they may slowly worsen. A stroke is a medical emergency. Immediate treatment can save lives and reduce disability. Call 999 or 112, or your local emergency number, or seek immediate medical care at the first signs of a stroke. It is very important for individuals who are having stroke signs to get to a hospital quickly. If the stroke is caused by a blood clot, a clot-busting drug may be given to dissolve the clot. Most of the time, patients must reach a hospital within 3 hours after symptoms start. Some people may be able to receive these drugs for up to 4 - 5 hours after symptoms start. Treatment depends on the severity and cause of the stroke. A hospital stay is necessary for most strokes. Tendonitis is inflammation, irritation, and swelling of a tendon, which is the fibrous structure that joins muscle to bone. In many cases, tendon degeneration is also present. Tendonitis can occur because of injury, overuse, or with ageing as the tendon loses elasticity. It may even be seen in persons with body-wide (systemic) diseases such as rheumatoid arthritis or diabetes. The goal of treatment is to relieve pain and reduce inflammation. Rest or immobilization of the affected tendons is helpful for recovery. This may be achieved using a splint or a removable brace. The application of heat or cold to the affected area can help. Nonsteroidal anti-inflammatory medications (NSAIDs), such as aspirin or ibuprofen, can also reduce both pain and inflammation. Steroid injections in to the tendon sheath may even be useful in controlling pain and allowing physical therapy to start. Rarely, surgery is necessary to physically remove the inflammatory tissue from around the tendon. Physical therapy that stretches and strengthens the muscle and tendon is essential. This can restore the tendon's ability to function properly, improve healing, and prevent future injury. Tendonitis can improve with treatment and rest. If the condition is caused by overuse, a change in work habits may be indicated to prevent recurrence of the problem. Tenosynivitis is the inflammation of the fluid-filled sheath (called the synovium) that surrounds a tendon. Signs of tenosynivitis include pain, swelling & difficulty moving the particular joint where the inflammation occurs. When the condition causes the finger to stick in a flexed position, this is called "stenosing" tenosynovitis, often known as "Trigger Finger". Treatments for tenosynovitis depend on the severity of the inflammation and on which tendon is affected. Mild tenosynovitis causing a small amount of swelling can be treated with non-steroidal anti-inflammatory drugs (NSAID) such as ibuprofen, taken to reduce inflammation and as an analgesic. Resting the affected tendon/s is essential for recovery; a brace is often recommended. Physical or Occupational therapy may even be beneficial in reducing the symptoms. More acute cases are treated with cortisone (steroid) injections, then a work of paracetamol & ibuprofen for pain. Outpatient surgical procedure can be used to enlarge the synovium. The sprained tendon or limb may be splinted for a week or so. Acupuncture may help in treating tenosynivitis.